Today's My Best Creative Day: Citrus and Blossoms!!!!! 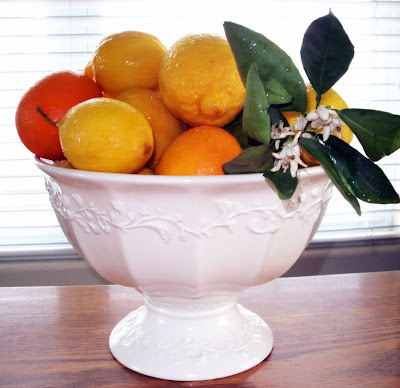 I was so surprised and so HAPPY today because Beth sent me a box of oranges and lemons and citrus blossoms!!!!!!!! It totally MADE MY DAY! THANK YOU, THANK YOU, THANK YOU BETH!!!!!! Beautiful picture - what a thoughtful sister you have! The citrus blossoms smell more and more wonderful every day. I hope they are still fragrant when you come in two weeks. Wow! That picture looks like it came out of a magazine. Actually all your pictures of food do!! !